According to IDC (refer chart below), Samsung overall smart phone market share has dropped 7% from 32.21% in 2Q13 to 25.16% in 2Q14, Apple's too has experienced slight drop of 1% in the same period. According to IDC (refer chart below), Samsung overall smart phone market share has dropped 7% from 32.21% in 2Q13 to 25.16% in 2Q14, Apple's too has experienced slight drop of 1% in the same period. 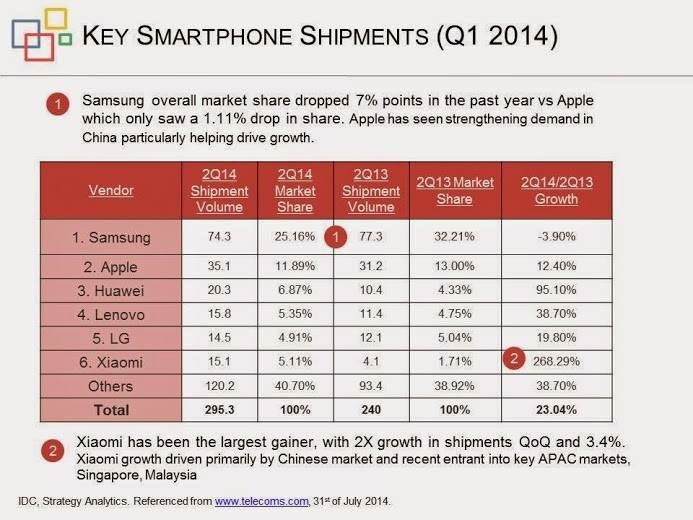 In fact, three or half of the top six smart phone shipments in 2014 are Chinese brands - Huawei, Lenovo and Xiaomi. Globally, traditional smart phone brands like Samsung and Apple are definitely feeling the threat from the Chinese brands. Huawei, overtaking Lenovo as the third largest smart phone brand in terms of global shipment volume, has posed the biggest challenge to the Korean and US brands. We have previously analyzed how Huawei disrupt smart phone market with e-commerce. This time around, we are going to take a closer look on how Huawei sell smart phone online with the online-dedicated brand Honor, via its e-commerce site Vmall. Similar to other mobile phone manufacturer, Huawei carries the Ascend series that travel across the "traditional distribution" via distributors and dealers before reaching consumers. However, Honor series is being introduced about three years ago in China, available only online mainly via Vmall.com. Seeing strong growth of Honor and Vmall, Huawei has planned for global expansion and Malaysia has been selected as Vmall's first stop out of China. When asked why Malaysia is the first in the radar, Nicolas Zhuhaifeng, Huawei's Director of Honor E-commerce Business of South Pacific believes Malaysia "ticks all the right boxes" in terms of e-commerce environment, potential and diversification. "There is no doubt that Malaysia is getting matured in terms of Internet (penetration) and infrastructure (payment and fulfillment), ahead of most of the Southeast Asia countries. On top of that, e-commerce market is apparently still small here which represents huge growth potential", explains Nicholas. According to Nicholas, Malaysia with multi-racial society also provides the right market for diversity marketing, an ideal platform to enter a new market. Besides Vmall.my being the first global expansion, Malaysia has also been made the HQ of South Pacific, which includes markets like Australia, New Zealand, Singapore, Indonesia, Philippines and Malaysia itself. Vmall and Honor might be seen as new brands penetrating the market with disruptive strategy but Huawei already has a long history in Malaysia without realized by most. In fact, most of local populations have indirectly used Huawei's services according to Nicolas, as Huawei is the leading technology provider on telecommunication infrastructure to major telcos in the world as well as Malaysia. Depending on whether you want to see this as a competitive or trickery move, Vmall has been launched (introducing Honor 3C model) on 29 April 2014. Honor 3C is Huawei's first model available exclusively online via Vmall and key marketplace partners like Lelong.my. When asked about the online sales, "It has surpassed our expectations really, at one time Vmall alone is getting 5,000 orders placed almost concurrently, that is immense", recalls Nicholas. Mr Wei, Director of Lelong.my concurs "Honor 3C is the hot-selling item on Lelong.my, and undeniably it is a good solid phone at very reasonable price, I even recommend this to most of my friends!" It is indeed an impressive start for a new online store like Vmall, and you might be wondering what kind of marketing activities are in place to launch the new site and model. "We didn't allocate big marketing dollars for a big-bang launch, in fact we didn't even have any systematic plan or investment on acquiring traffic to our site", says Nicholas. According to Nicholas, the peak of 5,000 concurrent orders mentioned earlier came about 1-2 weeks after the launch when they were accepting the second batch of orders. "We invest more into the product quality rather than marketing dollars. We believe the core of e-commerce is to start from product quality and putting customers first, for example provide one-to-one exchange within six months from the purchase date just because we are confident with our product quality", emphasizes Nicholas. Besides that, Nicholas adds that 85% of orders placed online will receive the Honor unit on the second day, while another 15% takes more than a day due to isolated areas. In fact, Nicholas claims that 98% of orders will be received by the customers within 48 hours upon placing online order. 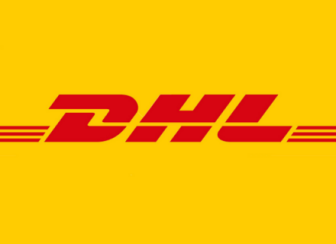 "For any orders that take more than 7 days, the customers will receive one-to-one apology by our CS (Customer Service) Manager", adds Nicholas. Nicolas comments that Honor series focus on digital native and youth market. "Our main objective is to provide the best quality and value-for-money smart phone to Malaysians with good online shopping experience, followed by strengthening Honor brand here", explains Nicolas. "We have always put in more than 100% commitment to satisfy our customer, we have observed that our first batch customers are referring Honor 3C to their friends and relatives via testimonials", Nicholas adds that word-of-mouth is a key element for Vmall & Honor growth here, on top of the disruptive marketing. 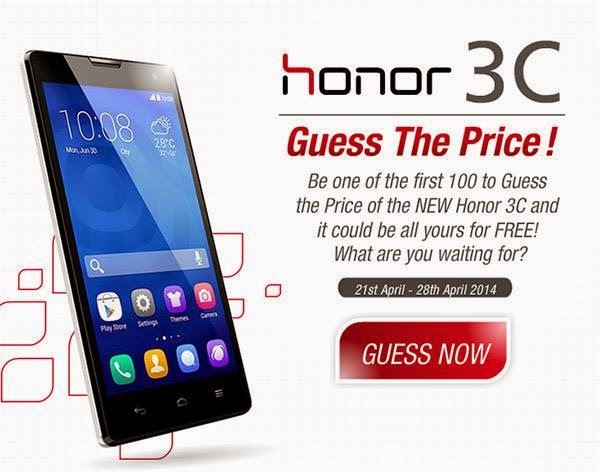 Honor relies on creative campaigns like "Guess the Price" prior to the launch of Honor 3C (and a similar campaign with the recent pre-launch of Honor 6) instead of allocate big advertising budget on ATL communications. "I remember more than 170 guessed the Honor 3C price correctly and visited Vmall.my almost at the same time, but we had only allocated 100 winners initially. However, we thought it is important to deliver the promise to all our customers by giving out more than 170 units to all of those who have guessed correctly " recalls Nicolas. There was even a case when the local team was testing on http://test.vmall.my prior to the launch, and someone was smart enough to find out about the testing site (even though it was not supposed to be publicly accessible) and place an order of Honor 3C with only RM8. "We admitted it is our mistake and decided to honor the deal by sending him an Honor 3C unit for free. We refunded RM8 to him as Honor 3C is not valued at RM8, at the same time we deliver promise to our customers", adds Nicolas. You might have heard stories on many global companies venturing into Malaysia without being really local. Being the largest telecommunications equipment maker in the world, what are Huawei's takes on this? "On Vmall and Honor, we work with local partners who share similar mission with us - delivering value to the customers. We partner with local marketplaces like Lelong.my for the launch of our Honor series, and we work closely with local logistic companies", comments Nicholas. "More importantly, we hire local team and our local customer service team is able to handle 3 major languages in Malaysia, so less communication breakdowns and customers would feel closer to us", adds Nicholas. As Malaysia is really different from China, it is interesting to find out how the local Huawei team did their testing prior to the launch of Vmall. "We tested out with selling movie tickets, and we deliver the movie tickets by putting them into the box which has the exact size of those carrying our Honor units", recalls Nicholas. As reported earlier on the showdown of Huawei vs Xiaomi, Xiaomi might be strong in China and some Chinese-populated markets but Huawei arguably has greater global potential. Being the #1 telecommunication service provider and #3 smart phone manufacturer, Huawei is able to deliver high-quality products leveraging on its R&D strength. According to Nicholas, Huawei currently has more than 26 R&D centers globally attracting best talents all over the world. As of December 31, 2013, Huawei has 16 R&D centers, 28 joint innovation centers, 150,000 employees. It is interesting to hear from Nicolas that 45% (or about 70,000) employees are specialized in R&D. Perhaps due to its R&D strength, Huawei has filed a total of 44,168 patent applications in China, 14,555 PCT patent applications and 18,791 patent applications outside of China. A total of 36,511 patent applications have been granted. "It is through our R&D strength, production ecosystem, global supply and online distribution model, we are able to deliver extreme user experience, cost-effective and best value-for-money smart phones to our customers", Nicholas adds that with better product quality-control, warranty claims (which are usually factored into the cost of selling) can be reduced. "It is not all about disruptive marketing, it is about delivering the value via our product (Honor) and service (Vmall). "性价比" (price-performance ratio) is our solid foundation, and with good service on delivery and customer support, I have strong confidence on Vmall and Honor's growth, not only in Malaysia but also the new potential markets", says Nicholas. 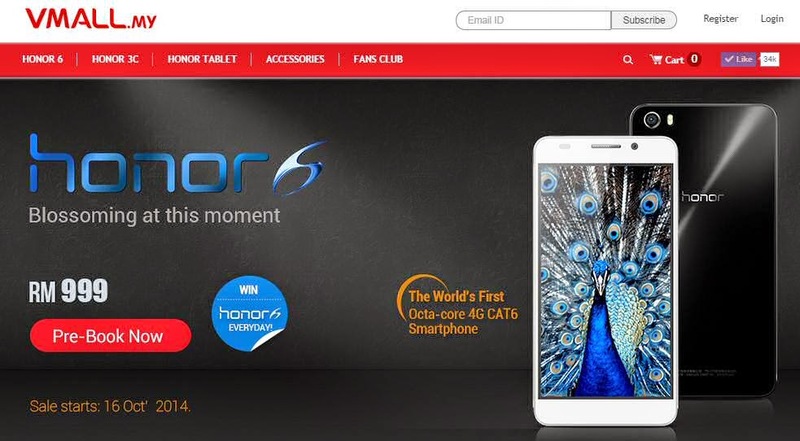 You can pre-book Honor 6 via Vmall.my (yes, online only) and experience yourself the smart phone of Honor. Disclaimer: This is a sponsored article.